Some nights just feeling like a changing of the guard. Not just any old championship switch, mind you. We’ve had eight of those in the UFC alone in the past 13 months, and that’s not even bothering to count the interim belts which have been handed out like Halloween candies. No, sometimes you know when you’ve seen a generational passing of the torch, the equivalent of the scene in the nature show where the young buck wins the territorial battle with the alpha male and assumes control of the herd. That’s what it felt like as we watched UFC 212 in Rio de Janeiro on Saturday night, as 25-year-old Max Holloway fearlessly walked into Jose Aldo’s domain and claimed his throne. This wasn’t just the UFC title change of the month. This echoed back to Sacramento at UFC 65, watching the young hotshot Georges St-Pierre steamroll over Matt Hughes, the man who had dominated the welterweight division, and assumed his place as the next one. Or UFC 128 in Newark, where the prodigy Jon Jones methodically picked apart Mauricio Rua, a former PRIDE tourney champ who had adapted to the UFC and won light heavyweight gold. Some nights simply feel like the dawn of new eras. Like when a fighter on a 10-fight win streak goes into enemy turf, patiently waits out the initial burst of adrenaline, stays calm where so many of the champ’s other opponents had panicked under pressure, then turns up the heat and never stops until the job was done. Of course, things change faster one can say the phrase “Machida Era.” St-Pierre, after all, got tagged by Matt Serra in his very next fight after defeating Hughes. But that turned out to be a blip in the road before GSP asserted himself and earned his spot on the short list of the game’s greatest champions. And Jones has proven his own most formidable opponent. Still, sometimes you just know. This isn’t a prediction that Max Holloway is never going to lose. But we’re willing to be that if we Google UFC 212 a decade down the road, there’s a solid chance we’ll look back and say that was the night the UFC’s next great champion was crowned. Down: Jose Aldo It’s unfortunate for Aldo that his biggest career failures came in his biggest spotlights. A generation of Conor-come-lately fans only seem to know Aldo as the guy who got knocked out in 13 seconds by McGregor. Those same fans also apparently took a nap when Aldo schooled Frankie Edgar, but regardless, now the McGregor loss, 18 months later, has been followed up by absorbing a wicked beating from Holloway on Aldo’s home turf. Those fans weren’t around when Aldo buzzsawed his way through the WEC, ushered featherweight into the UFC, and left a trail of bodies in his wake. Still, all that said, it’s hard to envision Aldo getting right back on top this time. Holloway with the belt has a bunch a fresh fights in front of him. And the UFC isn’t likely to do too many favors for a guy who spent so much of his prime pulling out of fights, taking long breaks, threatening retirement when things didn’t go his way, and just this week announced he’d start picking his opponents going forward. The McGregor loss wasn’t Aldo’s permanent downward fall, but last night might have been it’s start. Up: Claudia Gadelha. It’s hard to get a third fight against someone who’s already defeated you twice. Joseph Benavidez has been knocking off one fighter after another in the UFC flyweight division and still hasn’t gotten a third try at champion Demetrious Johnson, whom he last fought in 2013. Gadelha, for her part, lost a razor-thin decision to Joanna Jedrjezcyzk before the latter won the strawweight belt, then lost their rematch last summer. But she’s 15-0 when not fighting Joanna Champion. And she made it clear she’s still the second-best fighter in the division (sorry, Rose Namajunas) last night by rolling over Karolina Kowalkiewicz for a first-round submission. Most impressive, though, is her maturity about the situation. She’s gone to JacksonWink, changed her approach, and seems patient about her prospects. It might take awhile, but Gadelha’s making all the right moves for a fighter in her position. Hold: Vitor Belfort Somehow, “The Phenom” keeps moving on, keeps finding his next gig, keeps shape-shifting his way to stay in the picture, long after it’s assumed he’s finished, like some sort of Brazilian Dan Henderson. The 40-year-old Belfort got the nod Saturday night against Nate Marquardt (Side note: how crazy is it that in June 2017, we found ourselves watching a UFC one-night tourney winner fight a King of Pancrase? Maybe both of them can compete in a RINGS tourney next), enabling him to get away with telling fans he has five fights left in him. Still, this was Belfort’s first win in his past four fights, and it was against more or less a shot opponent. We’ll certainly give the wily Belfort his due for once again somehow managing to maintain his relevance, but we’re not sure the results in the cage are going to get any better from here. Down: Marlon Moraes First off, let’s give the former longtime World Series of Fighting champion some credit for diving straight into the deep end of the UFC bantamweight division. Rafael Assuncao is no joke, the winner of nine out of his past 10 fights. And he fights a style that makes it impossible to look good even if you do beat him. Still, Moraes, who entered on a 13-fight win streak. did nothing to dissuade the notion he’d been feasting on soft competition in the past, as he appeared tentative and never got on track in his UFC debut. Maybe it was simply a matter of the infamous UFC Jitters, and we’re certainly not brushing him off after one loss. But the idea he might be fast tracked to the top at 135 has come and gone. Up: Brian Kelleher Speaking of first impressions, this bantamweight’s UFC debut could scarcely have gone any better. Fighting on the cable prelims, Kelleher took on Brazilian Iuri Alcantara, who has 14 submissions among his 27 career finishes, on his home turf. And what did he do? Kelleher went out and submitted him in under two minutes. Then he mocked the Brazilians with their own chants. Then he all but called out the entire division. It makes you wonder why it took Kelleher to age 30 before getting the call to the big leagues in his 24th fight. Idle trash talk is one thing. Going into Brazil, submitting a submission specialist, then issuing callout is something entirely different. Kelleher is going to be a fun one to watch. Refereeing took center stage on Saturday night. First came referee Mario Yamasaki, who let Johnny Eduardo take a hellacious beating from Matthew Lopez before waving off the fight. I’ve joked that Yamasaki is like the guy who yells “finish him” in Mortal Kombat. Now I’m starting to think if Mario was the Mortal Kombat ref, Liu Kang would pelt Scorpio with fireballs until his was burnt beyond recognition. On the other end of things, a very entertaining welterweight matchup between Erick Silva and Yancy Medeiros came to a halt too soon when referee Eduardo Herdy stepped in while Silva, though rocked, was still intelligently defending. You know who got it right? John McCarthy. McCarthy gave Aldo, the champion defending the title in front of his home fans, every opportunity to hang on to his championship in front of his fans. There is, in fact, a sliding scale on those sort of judgment calls. Being a referee means understanding the situation and the circumstances, knowing the stakes, and knowing what the fighter can and can’t take. There’s a reason we’re at UFC 212 and a referee who started at UFC 2 is still the third man in for pay-per-view main events. … okay, so in this case, there’s the fight I’d like to see in a perfect world, and then the fight which we’re probably going to get, which also happens to be one hell of a fight in its own right. In a perfect world? Let me see Conor McGregor vs. Max Holloway. Holloway was 22 years old when he fought McGregor back in Boston, and even then, he was the only fighter to take McGregor the distance in a UFC featherweight fight. Now, with McGregor accomplishing everything he’s done, Holloway winning 11 fights in a row, and both conquering Aldo? Yeah, that’s a fight I want to see. That fight, of course, is also McGregor’s third-best option at the moment. If he gets his boxing match with Floyd Mayweather, we might never see him fight MMA again. If he does return to the sport, a trilogy fight with Nate Diaz is the biggest-money option out here in this sport. But Holloway’s emergence — the guy who took McGregor the distance as a 22-year old, then won 11 straight fights and claimed the 145 belt — is now a bargaining chip the UFC can use to keep Diaz’s contract demands in check. If Diaz asks for too much, they can turn around and sell Holloway coming up to 155, regardless of what Holloway might be saying now. Meanwhile, as all that plays out, a tremendous Holloway vs. Frankie Edgar fight lies in wait. Edgar’s 7-0 at featherweight when not fighting Aldo and just mauled the supposed Next One in Yair Rodriguez. 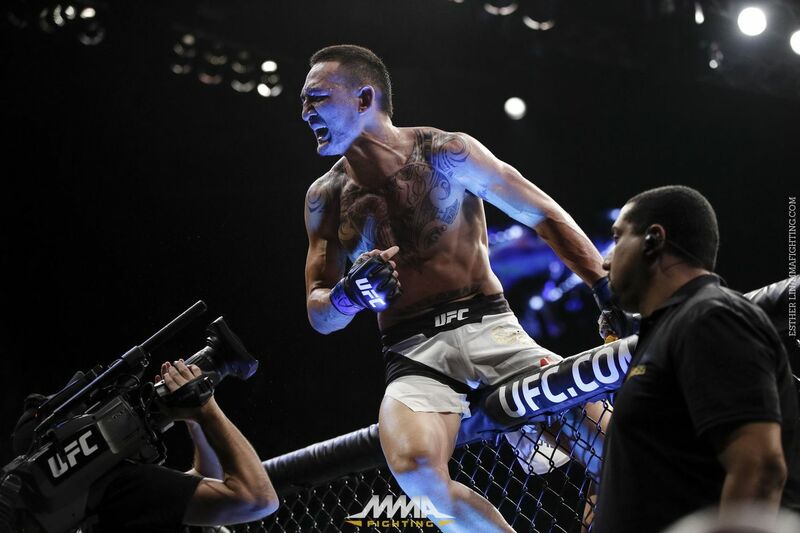 Holloway is still building his legend and a victory over Edgar would give him three consecutive wins over former titleholders (Pettis, Aldo, and Edgar). However this pans out, Holloway’s next fight should be a win-win for the fans. Monday Morning Hangover: What’s next for Fabricio Werdum after knockout loss at UFC 198?